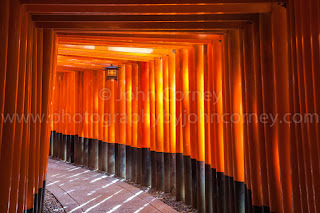 On a trip to Japan last October I visited the Fushimi Inari temple in Kyoto. A big banner at the entrance proudly proclaimed that it was the most-popular site with foreign visitors for 2 or 3 years running according to Trip Advisor. The number of visitors on that weekday was testament to this claim, however, the site is very extensive, and probably a majority of tourists don't actually make it all the way to the top of the mountain, so don't be put off. It is very accessible from the Kyoto train station (Kyoto-Eki in Japanese), just 2 or three quick stops by a local JR train. Then it's a quick walk across the street to the entrance. Fushimi Inari is probably most well-known for its vermillion-colored "tori" (Shinto gates) which line the pathway to the summit of the mountain. Each tori actually represents a donation to the shrine, mostly from businesses; a key principle of the shrine is to implore the good favor of the gods for the success of one's business. Early on this was particularly the business of growing rice, and a feature of the place is the many statues and images of foxes which hold a key to the rice granary in their mouths. It is believed that the fox intercedes between the businessman or woman and the gods. Anyhow, please visit it you get a chance, and be sure to climb the entire way to the top. I saw many "obaachan" (grandmothers) making their way all the way to the top, so if they can do it, you can do it! Allow yourself a couple of hours for your visit.